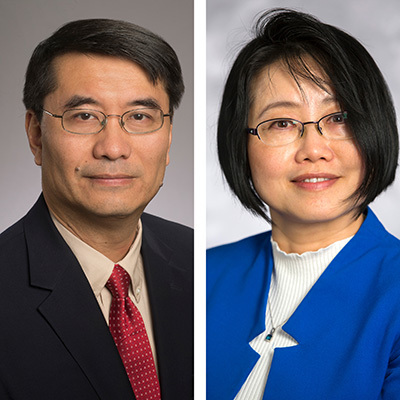 Winship researchers Hui-Kuo Shu, MD, PhD, and Hyunsuk Shim, PhD, are principal investigators of a new clinical trial to improve glioblastoma outcomes. Winship researchers Hyunsuk Shim, PhD and Hui-Kuo Shu, MD, PhD are principal investigators of a new NCI R01 grant that will initiate clinical trials at Emory and two other sites to improve outcomes for patients with glioblastoma, a highly malignant form of brain tumor. Clinical research teams at Johns Hopkins University and the University of Miami will also participate in the study which will start enrolling patients in July. The three year, $812,000 award will look at "improved whole brain spectroscopic MRI to guide radiation dose escalation for glioblastomas." Shim and Shu will present "Use of Whole Brain 3D for Spectroscopic MRI for the Management of GBM Patients" as part of the Medical Physics Monthly Lecture Series on May 24. View lecture details.